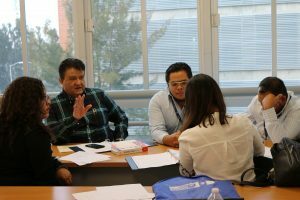 02/06/18 (written by Genesis Lopez) – Justice in Mexico’s Oral-Adversarial Skill-Building Immersion Seminar (OASIS) program held its first oral advocacy workshop of 2018 from January 19- 26, 2018, in collaboration with the University of Guadalajara (Universidad de Guadalajara, UdeG). The workshop launched the fourth year of the OASIS program. The OASIS program, funded through the U.S. State Department’s Bureau of International Narcotics and Law Enforcement Affairs (INL), emphasizes oral litigation skills through practical skill building exercises and theory instruction from experienced litigators. The extensive 40-hour workshop provided crucial instruction on oral techniques central to Mexico’s Criminal Justice System (Sistema de Justicia Penal, SJP). The SJP, fully implemented in 2016, introduced an adversarial model of criminal procedure, replacing Mexico’s traditional framework. This reform aims to increase transparency within the Mexican judicial system while reducing corruption and impunity that undermine the country’s progress. According to a 2016 report by the Center for Investigation and Development, A.C. (Centro de Investigación para el Desarollo, AC, CIDAC) Mexico’s implementation of SJP lacks a national strategy, consolidation, and equal access to a quality defense. The OASIS workshops provide its participants with skills imperative to the implementation of Mexico’s judicial system. Approximately 80 law professors and students from UdeG attended the workshop. OASIS Training Director Janice Deaton led a diverse team of instructors from Chile, Mexico, and the United States. These instructors, included: Eduardo Alonso Domínguez, Miroslava Pineda Zuñiga, Al Amado, Victor Torres, Michael Mandig, Bertha Alcalde, Carlos Espinoza Vidal, Frank Sánchez, and Alex Navidad. The instructors addressed five major topics: theory of the case, opening arguments, interrogation, cross-examination, and closing arguments. Through a diverse agenda of theory and practical exercises, the participants learned to analyze cases and improve their oral litigation skills. At the conclusion of the workshop, the participants applied the skills they learned over in a mock trial. The simulation was specially developed for the OASIS program, with participants adopting various roles on behalf of the defense or prosecution. The instructors acted as judges, overseeing the trial and providing constructive feedback. 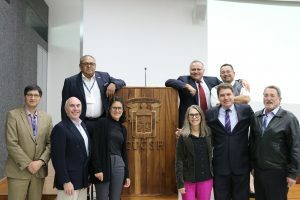 Since its inception, OASIS has worked with over 800 law students and professors from public universities in Mexico, promoting greater dialogue and legal training pertinent to Mexico’s criminal justice system. The next OASIS workshop will take place at the Autonomous University of Nuevo León (Universidad Autónoma de Nuevo León, UANL) in Monterrey, Nuevo León from February 23- March 3, 2018. “Hallazgos 2016: Seguimiento y Evaluación de la Operación del Sistema De Justicia Penal en México.” Centro de Investigación para el Desarollo, AC, CIDAC. June 18, 2017. 12/05/17 (written by Lucy Clement La Rosa) – The antithesis of democracy and good governance, corruption has repeatedly undermined development in Latin America and the Caribbean. Over recent years, the region has endured numerous corruption scandals; most recently, Colombia’s oil refinery embezzlement and Brazil’s Odebrecht scandal exposed the magnitude of political graft and crony capitalism. The multifariousness of corruption undermines the crucial building-blocks of society, including access to information, human rights protections, political processes, judicial institutions, and economic policies. Although the recent exposure and prosecution of corruption schemes across Latin America has stimulated regional dialogue on rule of law, public assessment of countries’ anti-corruption capacity remains perturbingly low. According to Transparency International’s latest Global Corruption Barometer, People and Corruption: Latin America and the Caribbean, corruption is on an upward trend. An average of 62% of over 22,000 Latin American constituents answered that the level of corruption in their respective country has increased since 2015. Moreover, 53% of the survey participants answered that their country’s government is poorly addressing the problem of corruption. The civil functionaries identified by the public as the most corrupt were elected officials and law enforcement agents, both indispensable to rule of law (Transparency International). However, in this case, bad news may be good news. The regional spotlight on perpetrators of corruption has stimulated public discourse and action; as Latin American countries increasingly acknowledge institutional voids in governance, the stage is set for reform. Notwithstanding, regional cooperation and anti-corruption capacity building will be essential in addressing the demands for transparency and accountability. Mexico has especially felt the cancer of corruption with malignancies across economic and political sectors. According to a 2015 report by the Mexican Institute for Competitiveness corruption costs Mexico about 9% of its annual Gross Domestic Product (Instituto Mexicano para la Competitividad, A. C.). Aside from draining Mexico’s pocketbooks, corruption has contributed to an increasingly disenchanted populous. Pew Research Center, identified Mexico’s top public concerns in 2017: crime, corrupt political leaders, and corrupt police officers. In a comparison between 2015 and 2017, these concerns have increased respectively by 10%, 12%, and 9% (Pew Research Center). Moreover, Transparency International identified Mexico’s bribery rate as the highest in the region with 51% of the populace paying a bribe for public services in the past 12 months, followed by the Dominican Republic and Peru with 46% and 39%, respectively (Transparency International). Highly publicized corruption scandals have only added fuel to the fire: including but not limited to, the massacre of 43 students and protestors from Ayotzinapa, Guerrero; the extended manhunt for the former governor of Veracruz, Javier Duarte, on charges of political graft and organized crime; the government surveillance spyware allegedly targeting a variety of high-profile human rights lawyers, anti-corruption activists and journalists; and allegations of negligence in the seismic wake of destruction following two earthquakes in September of 2017. In response, the public voice in Mexico has increasingly clamored for transparency and accountability. The galvanized public paved the way for the creation of a National Anti-Corruption System (Sistema Nacional Anticorrupción, SNA), civil society organizations like Mexicans Against Corruption and Impunity (Mexicanos Contra La Corrupción y La Impunidad, MCCI) and Transparencia Mexicana, and citizen initiatives, including the “3for3 Law,” which calls upon elected representatives to disclose personal assets, conflicts of interest and taxes. Nonetheless, the aforementioned anti-corruption stamina is arguably waning in the face of staunchly institutionalized corruption. The new anti-corruption system, SNA, has been hard-pressed to accomplish much against active government resistance, including, federal-level refusal to cooperate with corruption investigations, state-level inaction on constitutionally mandated deadlines, and multi-level withholding of information. Regardless of the government’s role in creating the SNA, critics argue that the initiative has been largely abandoned. 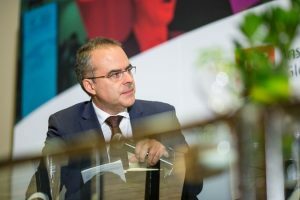 Juan Pardinas, President of the Mexico Institute for Competitiveness, dubbed this abrupt turnabout a Mexican government placebo scheme, intended to quell public outrage without any substantial compliance (New York Times). Although anti-corruption progress has been slow, there is hope for the future. With Mexico’s upcoming presidential elections in 2018, it is fair to assume that anti-corruption will be at the forefront of campaign platforms, seeking to allay public indignation and redeem government approval ratings. Likewise, this timely window of opportunity will offer the public a chance to demand pivotal action on anti-corruption reform and impress upon the future administration the strength of public will in Mexico. For a recent, in-depth summary of anti-corruption efforts in Mexico, Justice in Mexico recommends reading the aforementioned New York Times article. See below. 05/8/17 (written by Lucy Clement La Rosa) – The Guatemalan National Civil Police (Policía Nacional Civil, PNC) detained former governor of Mexico’s Veracruz state, Javier Duarte de Ochoa, on the evening of April 15 in Panajachel, Sololá, Guatemala. Duarte has been a fugitive of Mexico since October 2016, evading allegations of money laundering by the federal Attorney General’s Office of Mexico (Procuraduría General de la República, PGR). According to Manuel Noriega, deputy director of Interpol in Guatemala, Duarte was found at a hotel in Panajachel. Mexican officials informed Duarte that he had been found and requested that he give himself up to the Guatemalan authorities. Duarte did so voluntarily. Observing diplomatic relations with the PGR, the detention was conducted as a joint operation between the PNC and Guatemala’s Interpol office. Duarte was taken to the military prison, Matamoros, in Guatemala City. He will remain there until Mexico presents a formal request for extradition to the federal Attorney General’s office of Guatemala. Mexico will have 60 days to request Duarte’s extradition. The PGR released information on the day of Duarte’s arrest confirming that they intend to pursue extradition. Furthermore, the ruling Institutional Revolutionary Party (Partido Revolucionario Institucional, PRI) expressed their public support of the Guatemalan authorities and their role in detaining Duarte. Duarte is not the only PRI-affiliated politician that has been charged with allegations of corruption in recent weeks. Former Mexican state governor of Tamaulipas, Tomás Yarrington, was captured in early April by Italian authorities on charges of corruption in response to a U.S. extradition request, which was an embarrassment to Mexican authorities. 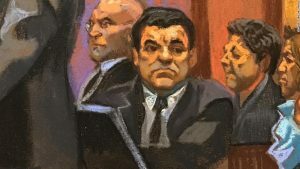 César Duarte, who was also wanted for similar charges of corruption was captured just a week later by Mexican authorities. Since disappearing six months ago, Duarte became a regional symbol of institutional corruption in Mexico. A former public official of the PRI, Duarte was accused of corruption and misappropriating state funds through his position in public office. The PGR began investigating these accusations in July of 2016. Javier Duarte, some months before he fled Mexico, standing outside of PGR headquarters in Mexico City. By September, Mexican authorities believed that Duarte used false identities and phantom companies to relocate public funds for personal benefit, which included acquiring over a dozen vacation homes. 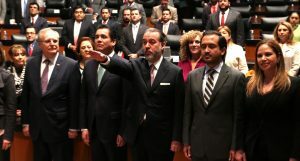 One month later, local congressional authorities reported that financial irregularities tied to Duarte’s dealings in 2015 accounted for more than $16,000 million Mexican pesos (about $850 million USD). Duarte, who served as governor of Veracruz for nearly six years, resigned on October 12, 2016. One week later, a federal judge issued a warrant for his arrest. 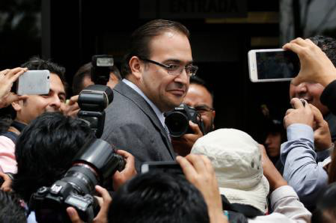 Although he publicly denied all charges, Duarte fled Mexico before he could be detained. Duarte was expelled from the PRI on October 25, 2016 and soon after; the PGR offered $15 million pesos for information leading to his whereabouts. Additionally, President Enrique Peña Nieto condemned Duarte’s actions before Mexico’s Supreme Court of the Nation (Suprema Corte de Justicia de la Nación). Although Javier Duarte has not denied the allegations pursuant to his imminent extradition, he has refused immediate and voluntary repatriation, requesting that Mexico formally pursue his extradition. According to César García, the Guatemalan judge presiding over Duarte’s extradition, this process may take anywhere from four to six months. Malkin, Elisabeth and Paulina Villegas. “Warrant for Mexican Ex-Official, Now on the Run, Is Seen as a Step in Graft Fight. The New York Times. October 20, 2016. “Javier Duarte, exgobernador prófugo de Veracruz, fue detenido en Guatemala.” Univisión. April 15, 2017. “Fugitive Mexican Ex-Gov. 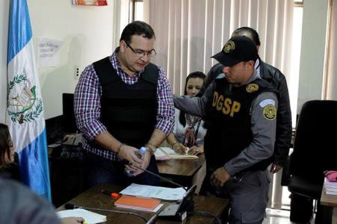 Javier Duarte Detained in Guatemala.” The New York Times. April 15,2017. “Javier Duarte, exgobernador de Veracruz, capturado en Guatemala, fue recluido en Matamoros. “Prensa Libre. April 16, 2017. “Javier Duarte, recluido en cárcel militar Matamoros, Guatemala.” Diario de Xalapa. April 16, 2017. Ramos, Jerson and Mynor Toc. “Javier Duarte rechaza ser extraditado a México.” Prensa Libre. April 19, 2017. “La detención de Javier Duarte, lo más viral de la semana.” El Universal. April 22, 2017. Dr. Raúl Cervantes Andrade, head of the Attorney General’s Office. Photo: Gobierno de México. 11/29/16 (written by Kimberly Heinle) — Mexican President Enrique Peña Nieto named the new head of the Attorney General’s Office (Procuraduría General de la República, PGR) in late October, an appointment that has been met with criticism and concern despite its overwhelming approval in Congress (83 votes in favor, 3 against, and 1 in abstentia). On October 26, Dr. Raúl Cervantes Andrade (53) of the Institutional Revolutionary Party (Partido Revolucionario Institucional, PRI) was sworn in as Attorney General following his years as a PRI Senator and legal counsel. Cervantes received his law degree from the Universidad Panamericana in Mexico City. Cervantes becomes the third head of the Attorney General’s Office under Peña Nieto in four years, replacing outgoing Mtra. Arely Gómez González (March 2015 – October 2016), as she transitioned to her new role as Secretary of Public Service (Secretaría de la Función Pública, SFP). Prior to Gómez González, Jesús Murillo Karam served as PGR, though his tenure ended in controversy amidst the ongoing investigation and sharp criticism surrounding the PGR’s and Peña Nieto administration’s serious mishandling of the case involving the disappearance and alleged murder of 43 students in Ayotzinapa, Guerrero, in September 2014. The rather quick PGR turnover rate under Peña Nieto parallels that under his predecessor, former President Felipe Calderón (2006-2012). Under Calderón, the role was filled by Eduardo Medina Mora (December 2006 – September 2009), Arturo Chávez (September 2009 – March 2011), and Marisela Morales (April 2011 – December 2012). The criticism surrounding the recently appointed Cervantes has less to do with the change in position, however, and more so with what Cervantes could mean for the integrity of the PGR and the position’s impartiality. The Attorney General is, by nature, intended to be impartial and to hold all accountable in the face of justice, including the president and other elected officials. The challenge that critics are raising, however, is that Cervantes is the first cousin of Peña Nieto’s personal lawyer, a senior confidant, and a longtime PRI loyalist, writes The Wall Street Journal. Critics have questioned whether Cervantes, a personal friend of Peña Nieto, will dare to challenge the president on issues that other Attorney General’s may once have done. Dr. Raúl Cervantes Andrade, center, was sworn in as Attorney General on October 26, 2016. Photo: Gobierno de México. The situation is further muddied when one considers that the Mexican government is in the midst of transitioning the position of the Attorney General from a six-year appointment to a nine-year post that transcends multiple presidential terms. As Mexico Voices explains, “A constitutional amendment passed in 2013 replaces the Attorney General’s Office with a Prosecutor General’s Office, whose head will have a term of nine years, crossing more than one six-year presidential term, ostensibly to make the prosecutor independent of presidential influence. Secondary laws implementing this change still have to be passed.” Once passed, the law then states that the sitting attorney general (in this case Cervantes) will then complete a full nine-year term, thus inferring that Cervantes will be in the role of Attorney General and then Independent Prosecutor through 2026. Nevertheless, Cervantes took the opportunity during his swearing in ceremony to bolster his loyalty to serving the Mexican people through the Attorney General’s Office. “We must construct a professional, effective, efficient, transparent, trustworthy, and strong institution,” reassured Cervantes. Wilkinson, Tracy. “Mexico’s embattled attorney general stepping down.” Los Angeles Times. February 27, 2015. Coe, Amanda. 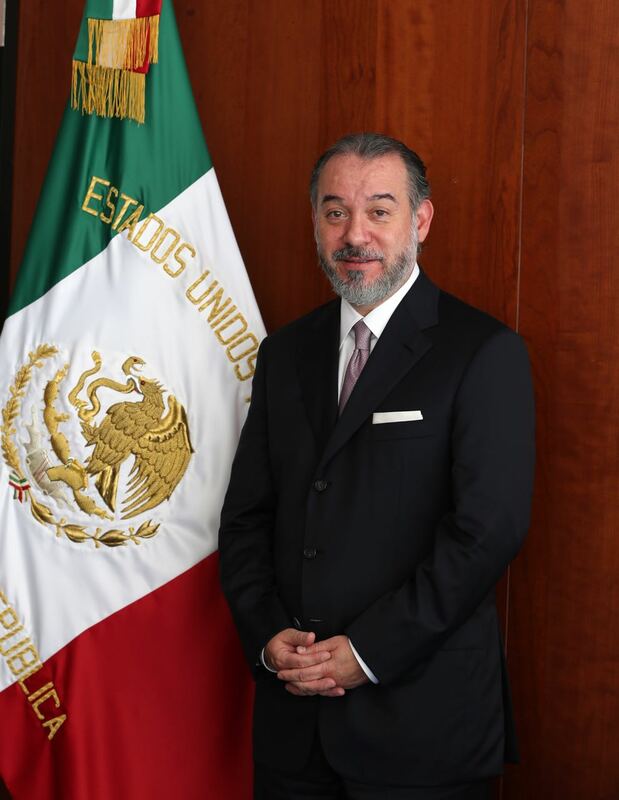 “Mexico Government: Raúl Cervantes, Loyal Party Member, Now Attorney General.” Mexico Voices. October 25, 2016. “Perfil. Arely Gómez González.” El Universal. October 25, 2016. Secretaría de la Función Pública. “Mtra. Arely Gómez González.” Gobierno de México. October 27, 2016. Gómez, Pablo. “Raúl Cervantes, del PRI a la PGR.” Proceso. October 28, 2016. Montes, Juan and Dudley Althaus. “Ally of Mexican President Enrique Peña Nieto Is Set to Get Anticorruption Post.” The Wall Street Journal. November 1, 2016. Procuraduría General de la República. “El Dr. Raúl Cervantes Andrade toma protesta como Procurador General de la República.” Gobierno de México. November 11, 2016.